I posted a few weeks ago (here) about the renovation of a local safe house run by Doorways. The main construction is being done by Sagatov Associates but we have recruited 6 amazing local interior designers, an office space designer, and two of my wonderful neighbors to each take on a room in the house. The house has 4 bedrooms, a living/dining room combination, a play room, 3 bathrooms, and 2 staff offices. It's a lot of rooms in a relatively small space! The designers certainly have their work cut out for them in these spaces. We'll have some better before pictures in the next couple of weeks. The picture above is pretty old and fortunately it's not quite as bad as this right now! 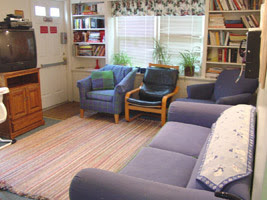 But, this is the main hang out space for the women and families who live here. I want to introduce the designers who are working on this project... Please go and check out their websites and work. They are all amazing and have real dedication to this project. I'll share their design ideas for you in the next few weeks. In addition we have Washington Workplace enlisted to help redesign and reorient the staff office space in the rear of the house. This space is critical since this is where the 24-hour emergency hotline is answered, and where the overnight staff sleeps (or doesn't sleep as the night may go). Finally, I am going to try my hand at redesigning the basement office which is fairly gross right now. Here's a preview of the "before". Plenty of room for improvement! Each of the designers is working on their design plans. Doorways staff has given their feedback and now we are confirming paint colors and ensuring flow between the spaces. We are very grateful to Sherwin-Williams for donating the paint to this worthwhile project. If you are interested in financially supporting any of the designers above with this project, please go to the Doorways website, and put "Safehouse - Designer Name" in the box for "additional information". These designers are making a tremendous effort and donation so I know they will appreciate any help they can get!